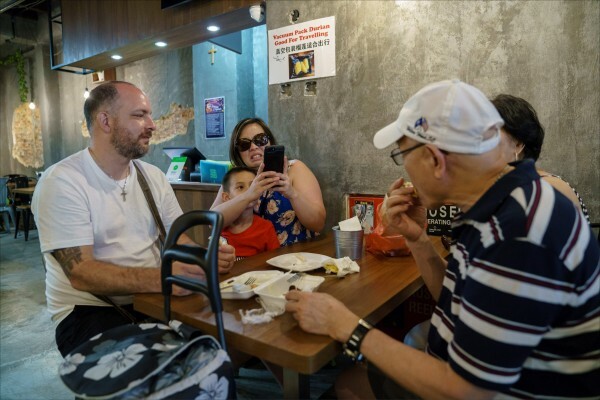 Mao Shan Wang, a Singapore eatery themed with durian, has caught the opportunity of success as patrons flock to the cafe in droves for a bite of its exotic offerings. The pungent tropical fruit long regarded as a delicacy in Southeast Asia has left a divisive trail － you either love it or hate it. Detractors often describe its intense smell as a mix of gym socks and onions, while enthusiasts liken the creamy texture and intense aroma to blue cheese. While the "bittersweet" fruit is usually eaten on its own or as dessert, the Mao Shan Wang cafe has a special menu with durian in all dishes. Customers can opt for chicken nuggets with a durian dip, pizza topped with durian flesh, all washed down with coffee － durian infused, of course. "What our company wanted to do was put it with savory stuff like fries and nuggets. We will be looking to expand the offerings as well, with maybe rice, pasta and other things," company spokesman Lance Lee said.